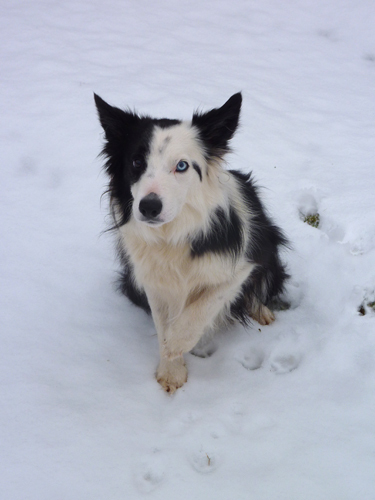 Harry – is it that cold? 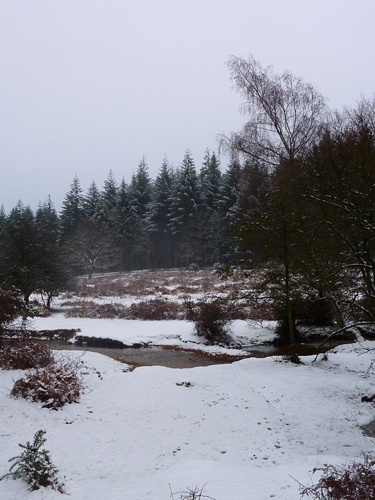 Our regular route has a very different look today – brrrr. 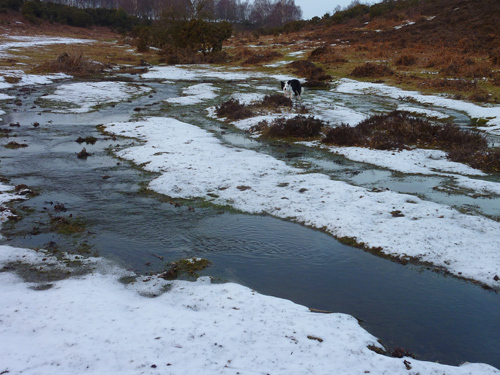 We don’t cross here as usual, but head up along the brook for a while. 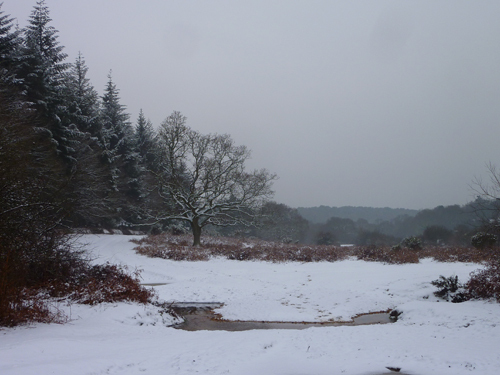 The view across Linford Brook to Little Linford Inclosure. That’s where we’re heading. To our right, murky and chilly. 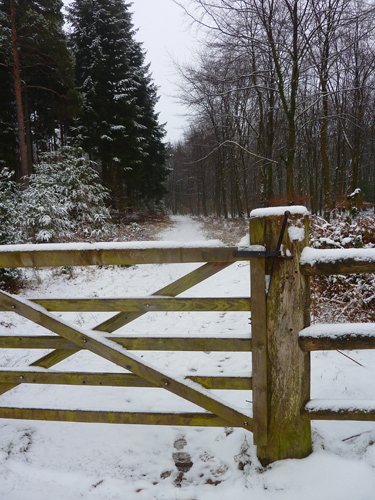 The gate to Little Linford Inclosure. 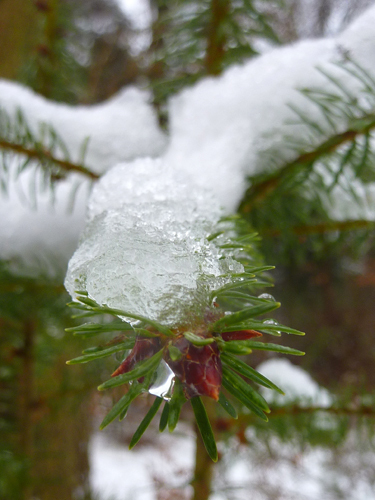 The warm winter has everything further forward than usual, here a pine bud is coated with snow. 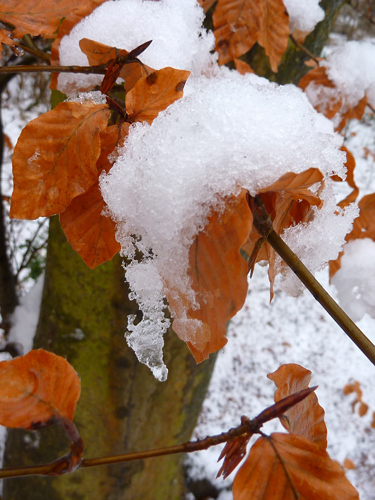 Bronze beech leaves still clinging to the branch. 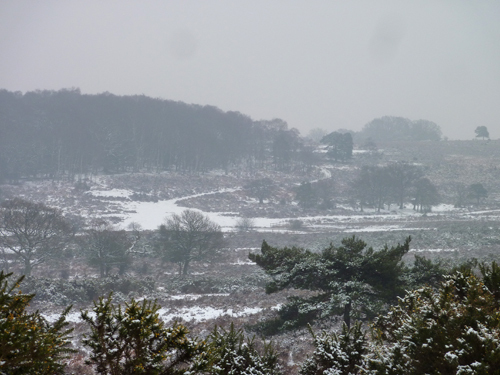 A wintry view from the gate at the top of Little Linford Inclosure looking down towards Shobley. It is so still and so quiet this morning – I could be the only person in the world. 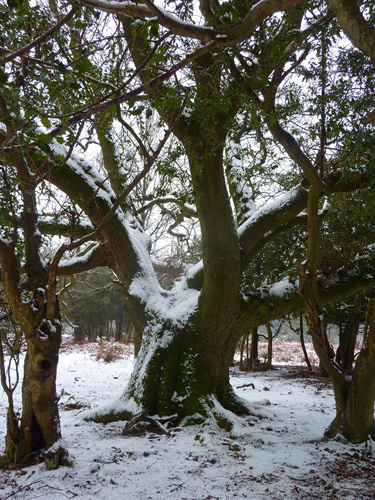 Snowy trees on Marrowbones Hill. 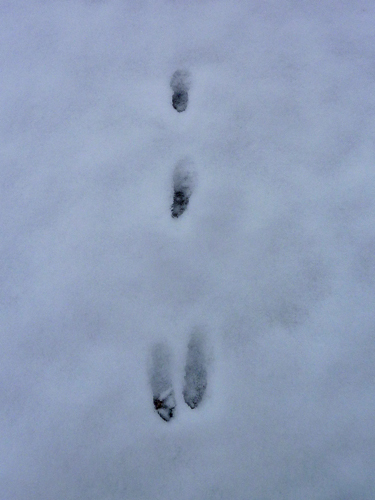 Harry prints – he wasn’t following the bunny – honest. 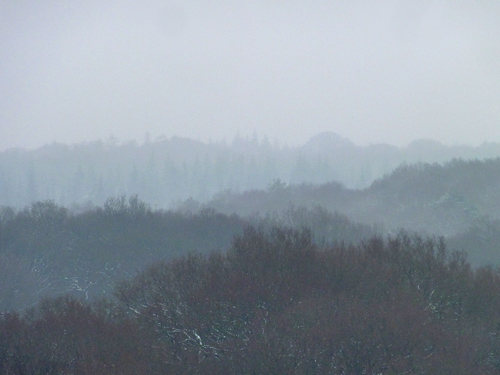 A misty view across the Forest – silence. 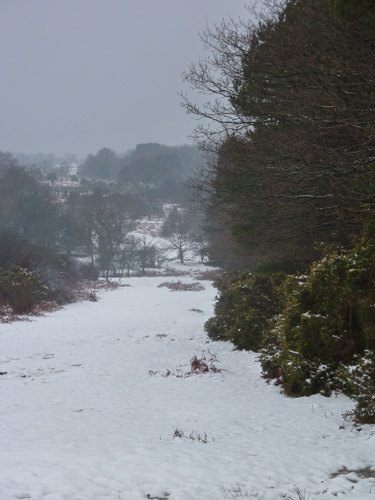 Snow carpeted heather and grass. 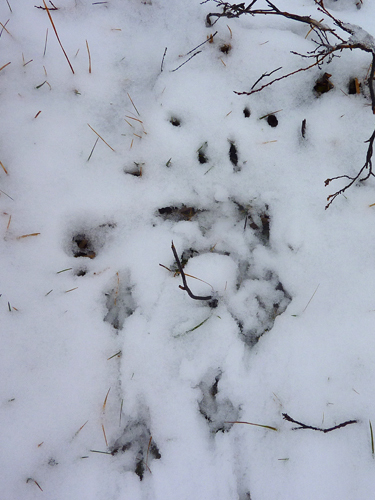 And some ears….? 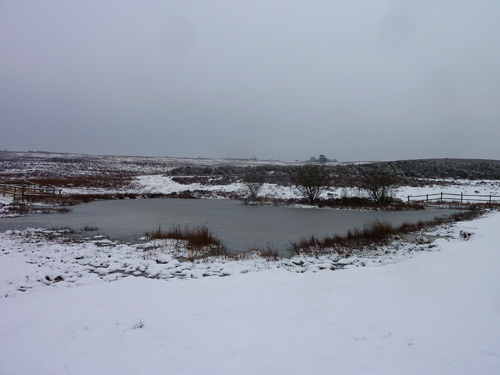 Across Akercome Bottom – almost monochrome. 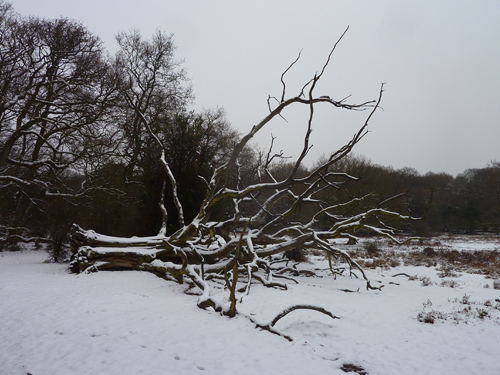 The shape of the huge fallen tree in Akercome Bottom is starkly picked out by the snow. 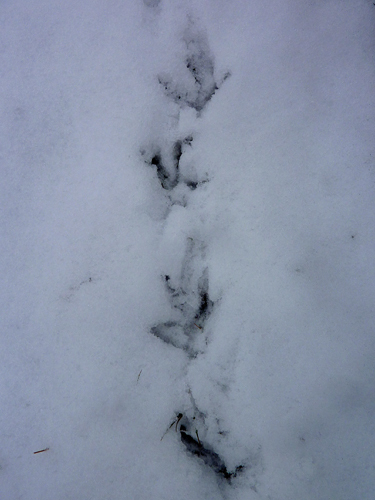 Bird prints – I have no idea what sort, but it was quite big and apparently running about all over the place. 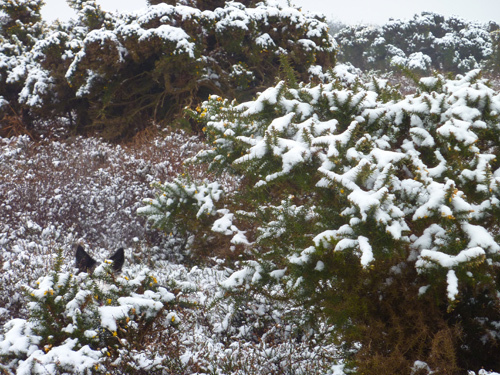 At this point he did a little circle in this break in the heather and there are what appear to be beaky marks in the snow at the top of his track. 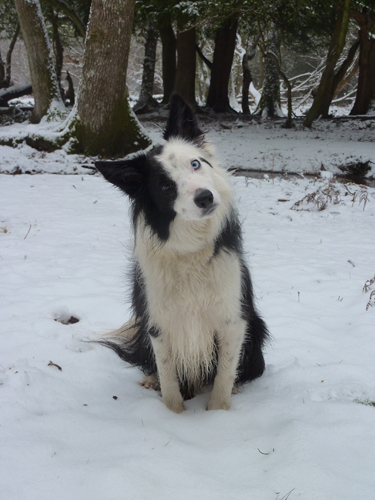 Foraging I guess?. 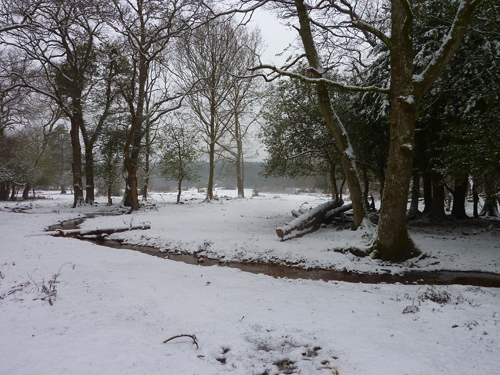 We follow Akercome Brook back down towards Linford Bottom. Harry has a question on his mind. 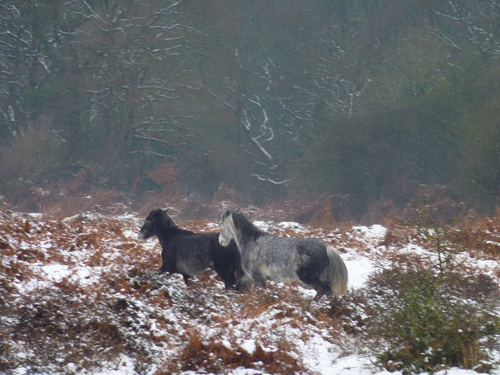 New Forest Ponies trotting across Linford Bottom. They break into a canter. 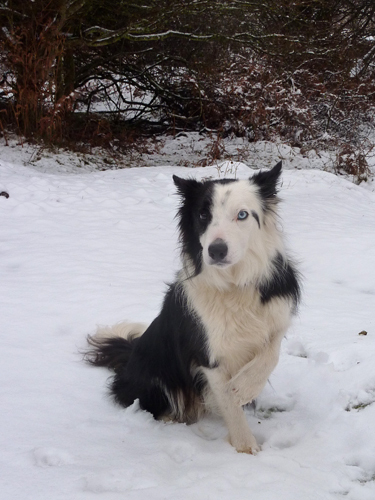 A snowball – literally. 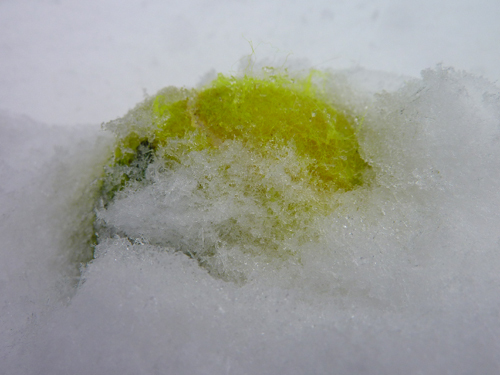 Harry’s tennis ball buried deep in the snow. 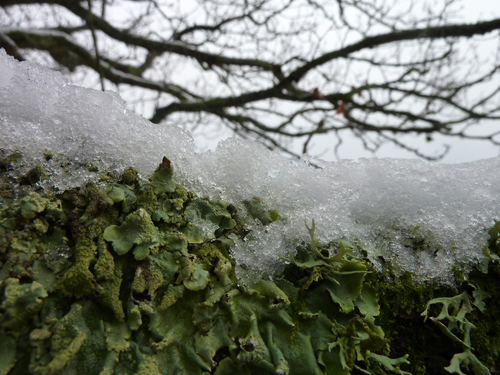 The snow has mostly melted over the day. 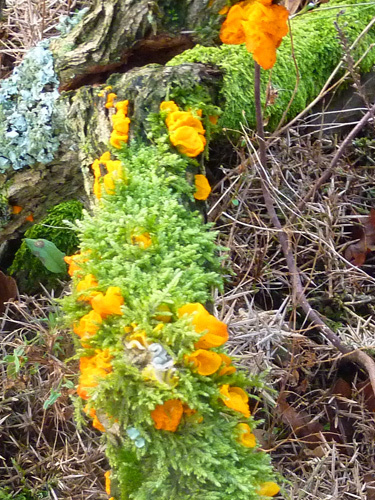 Despite the cold snap, there is still lots of pretty Witches Butter fungus growing on old gorse stems. 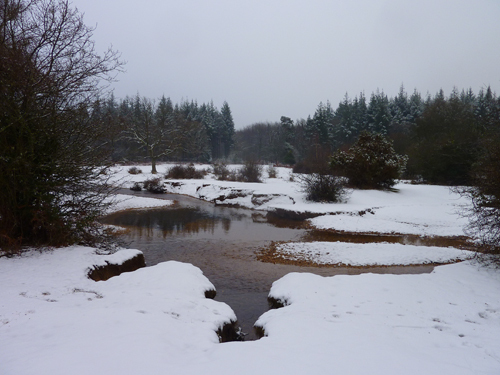 Big Whitemoor Bottom lies low and so has hung onto its wintry feel. 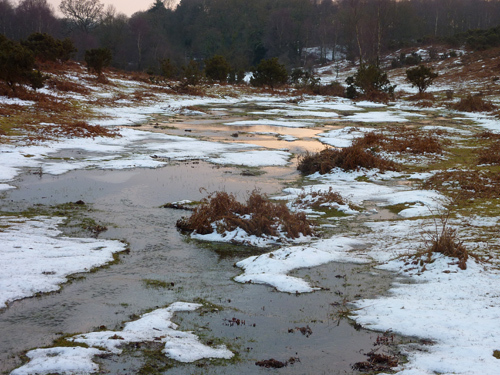 Looking back down the valley, the beginnings of the sunset are reflected in the ice. 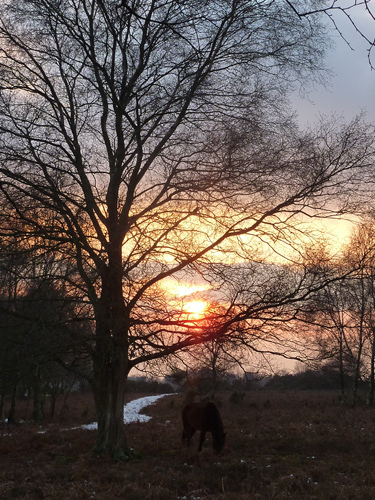 A New Forest Pony grazes under the birch trees. 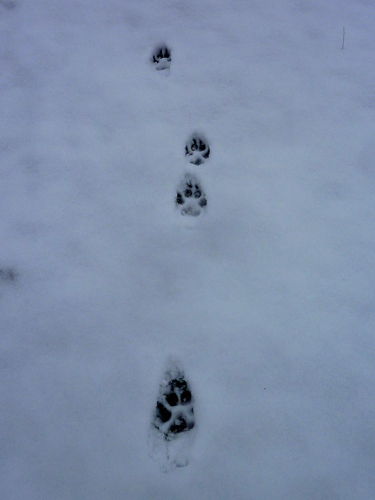 They’ll be glad that the snow didn’t last. 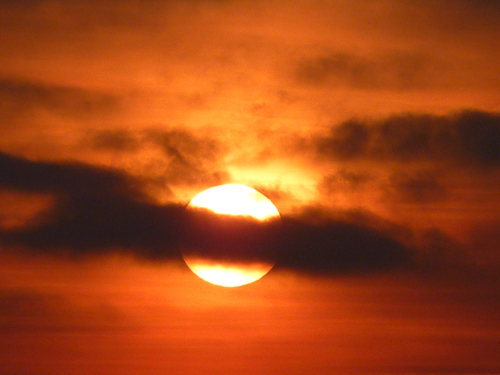 Shaping up for a lovely sunset. 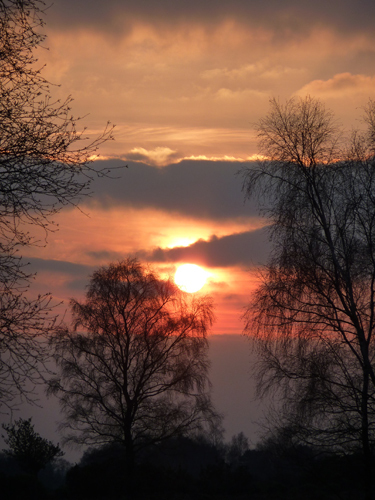 As anticipated – a stunner.